The Victoria Law Courts. BAH: WK/B11/4300. Reading through some of the logbook entries might give the impression that there were many children running unchecked around Birmingham. The intention of a Logbook to predominantly record unusual or notable events in the school’s life meant that normal behaviour would not be recorded. 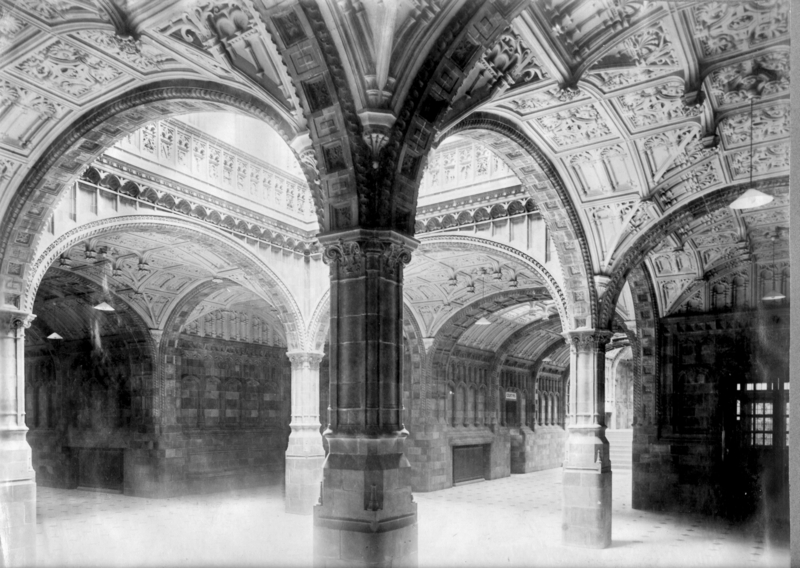 There were sometimes incidents which led to the offenders appearing at Birmingham’s Magistrates Court, the Victoria Law Courts. The boy Welch seems to have often been in trouble with the courts, being locked up again a few weeks later for smashing shop windows and stealing. [S68/2/1 24.11.1893] Whilst truanting alone could sometimes permit corporal punishment, it was the criminal activities during this time which most often took children to court. Yet these children were sentenced in the same court room as adults, receiving no special care as would be expected for their ages. In April 1905 Birmingham was groundbreaking in introducing the first Children’s Court in Europe, largely by the efforts of Mr J. Courtnenay Lord and the State Children’s Association. The SCA, formed in 1896, was a pressure group for children’s wellbeing and their campaign led to Birmingham Council setting up a sub-committee with Mr Lord as chair. 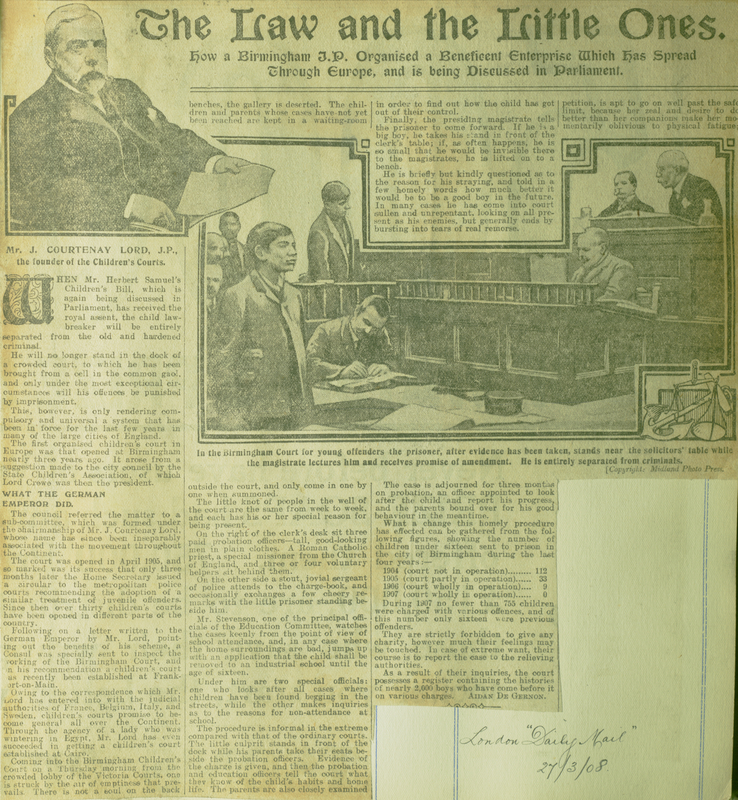 A 1908 Daily Mail article tells much about the running of Birmingham’s Court. This special Juvenile Court for under 16’s, which was set up to meet on Thursdays at 10 o’clock, saw 25 names in its first session. A Mail article made note that these were all boys, and that the court’s aims were to be “a correctional court, more than a penal court.” [13.4.05 The Mail] For the first time there was an attempt to distinguish the juvenile offender in court from those more serious criminal cases, and to keep the court separate with a degree of anonymity between the children. Birmingham’s example led to a wider adoption of such approaches to child offenders in the UK, and indeed in Europe. These changes came too late for the miscreant Welch. This entry was posted in News and tagged archives, birmingham, childhood, children, crime, education, heritage, school, truancy. Bookmark the permalink.